After the second or third kid, we parents have no problem admitting we have not only made changes to our home to child-proof it, but we’ve made big changes to weather the “storm” that is our child-run lives. We see those videos of solidarity all over social media making quips about “how Mom and Dad do date night, now that two tiny monsters rule the house” and “ways to make dinner easier and quicker for the family throughout the week.” Though, parenting multiple children extends far beyond 5-minute meals and date nights that end early enough to get the babysitter home at a decent hour—our homes go through an evolution, too. As a mom of five—yes, five; I don’t know why we didn’t stop at two—I’ve picked up a few “hacks” as they call them, to keep my Toronto, ON, house kid-proof, safe, and easy. Take what you will from this list! AKA the family “brain.” My husband and I tag-team by pinning bills, reminders, parent-teacher notes, field trip passes, and doctor appointment reminders to our enormous cork board. Of course, the little ones get to add their drawings, too. I’m a right-brainer, so having something out in the open in the center of our kitchen helps me to keep on top of weekly goings-on. Bless the Pinterest-er who introduced me to this! My boys have all sorts of noise-maker toys their grandparents got them (gee, thanks, Mom and Dad). Sometimes, it’s enough to make me want to scream. Anyway, the hack is tape. Block those speakers with a bit of Scotch tape and the noise is cut in HALF. Whether you buy them or make them with two adhesive hooks and a hair binder—it’s worth it to save your groceries from the kiddos. For us, we experienced the total destruction of our groceries twice from a door being ajar too long before we opted to keep little hands from the allure of the fridge door. We used to have this beautiful, rustic French door with all that detailed lattice. I loved it, I’m not going to lie to you. But, I couldn’t see my children clearly enough while they were outside at play. My husband had to convince me a bit on this change, but the truth is that our patio is just as lovely with the new sliding patio door in Toronto, ON from Brock Doors and Windows, as it was with the previous one. I can clearly see my children while they build snowmen and chase around the dog, and that puts this mom’s heart at ease. Plus, little hands don’t get slammed like they used to! Speaking of doors, I’ve adopted a hack from a close friend: my toddler can’t get her sweet little finger squished in the door with a piece of a pool noodle slit and wrapped around the edge. Parenting win! All but one of these hacks you can easily do yourself. 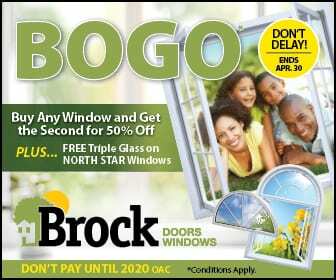 As for the patio door—give Brock Doors and Windows a call if you, too, want to be able to more clearly see your kids while they play outside. Happy parenting!